I don't know if it's my imagination but the autumn colours in Devon, especially Dartmoor seem to be much more vibrant this year. The yellows, oranges, and browns are really standing out on the trees. Woodlands are looking particularly spectacular. After seeing the wonderful colours down at Fingle Bridge the other week, I was determined to get out again and make the most of this special time of year. But where to go? Easy. My custom Google Map to the rescue again! Holne Bridge on the River Dart was another location that had been on my map for a while, and this seemed to be the perfect time to go. Though the weather forecast for that day was for rain showers, there was going to be a break for a few hours in the morning so off I headed to Dartmoor. I parked up just on the other side of Holne Bridge and started walking along the banks of the Dart. As expected the colours were brilliant, but it also appeared that the strong wind from the previous days had removed a lot of leaves from their branches. Not to be discouraged by this I got the camera set up and took this image of the river Dart from the east side of the bridge. 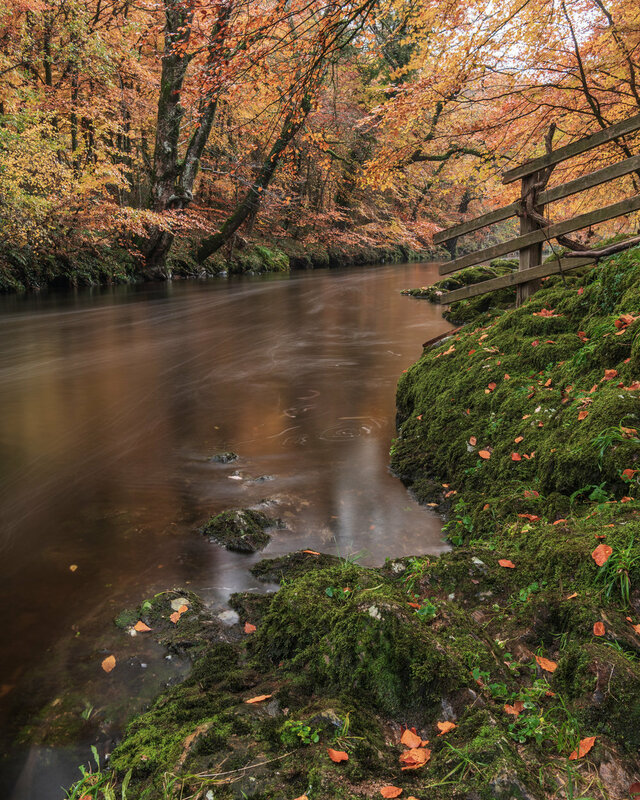 Autumn on the River Dart, Dartmoor, Devon - Nikon D850, Nikkor 24-70 mm f/2.8 VR at 25 mm, f/13, 10 seconds at ISO 64, Lee Filters Circular Polariser and ND Grad. Just as I started getting into my photography it started raining. At first, I thought it was just a light shower, but the rain started to come down heavily. I soon regretted not taking my waterproof jacket! Never mind, I packed the camera away and decided that this would be a good time to do some exploring. My weather app told me the rain was due to stop in 20 mins so I wouldn't have long to wait. While I was exploring the river bank looking for compositions, I spotted some woodland on the opposite side that I thought might suit an ICM shot. I had started experimenting with ICM when I was in Harris and Lewis and was interested enough with the results to try it again. Holne ICM, Dartmoor, Devon - Nikon D850, Nikkor 24-70 mm f/2.8 VR at 34 mm, f/8, 1.3 seconds at ISO 64, Lee Filters Circular Polariser. As you can see I need to work on my ICM technique and compositions a bit more. However, it did at least pass the time until the rain shower had passed. 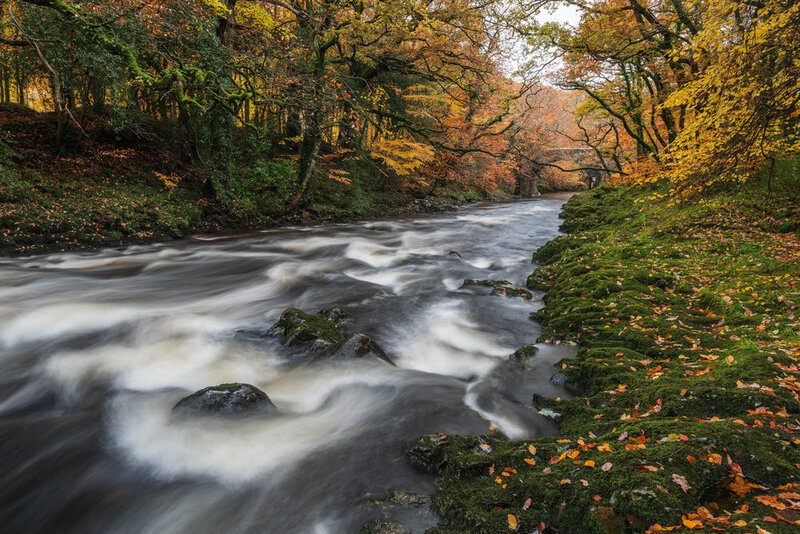 Once the rain had passed it was back to the job of capturing of autumnal images of the river Dart. There was still a fair amount of water flowing down the river making capturing engaging images a little more tricky. Too little water and the river looks dirty and bare, too much water and you just end up with a white blur. To make sure the river represented an important element in the composition I headed upstream from the bridge until I got a place where the water was cascading around and over some large boulders. Unfortunately, this was one of the very last images I had time to take that morning and I was soon heading home. Happy with the shots I had captured that morning the only problem I had was whether I should return again, go back to Fingle Bridge or try and find another autumnal location for my next trip out with the camera. What types of shot do you like to take during autumn? Have you tried ICM? What is your favourite season to photograph? Let me know in the comments.